Steven and Kerry welcome you to their traditional country pub that has wonderful views overlooking Boxford. 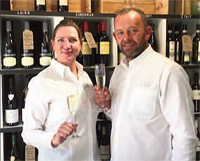 Box Valley Wine is a great little wine shop run by Vanessa van Heerden and her partner and local business owner, Steve Egglestone from Box Valley Building Services. A family run butchers selling high quality beef, pork, lamb and chicken, fresh vegetables, cheese, marinades, eggs and bread. Neil Cottrell and Robin Windmill invite you into their delicatessen and greengrocers. Kunal and Komal Odedra proudly present to you their general store. Will and Myalee Chaytor sell locally produced goods including coffee, panini and cakes.